Ryn is a small town in Mazury, beautifully situated on an isthmus between two lakes: Ołów, a closed water reservoir protected as a quiet zone, and Ryńskie Lake, which is connected to the complex of the Great Masurian Lakes. Above the town towers a 14th century Teutonic castle. It was raised on a hill, on a site most probably occupied earlier by a Galindian (old Prussian) fort. The legend says that the castle and Ołów Lake, which acts as a natural moat for the stronghold, reminded Teutonic Knights of the Rhein river and the castles which stood on its banks, which possibly explains the name of this Masurian town - Ryn. 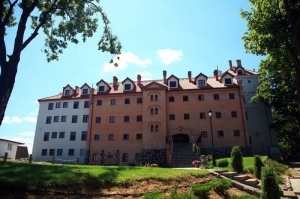 In 1393-1525 the castle was a seat for the local district of commandery (Komturei), and one of the first commanders appointed to administer the castle and the district was Konrad Wallendrod, a future Grand Master of the Teutonic Order, and a hero of Adam Mickiewicz's poem Konrad Wallenrod. 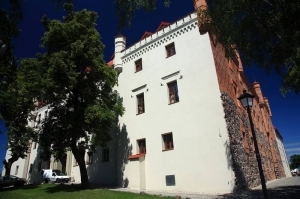 Apart from the military function (the fort was an important base for wars staged against Lithuanians), the castle also served as an administrative and economic centre, providing the Order with fish, honey and wild game. Despite its strategic location, thick walls and massive construction, the castle surrendered to the siege held by the Prussian Association in the mid-15th century. Any surviving knight, which was caught escaping from the castle was mercilessly drowned in one of the two lakes or in nearby swamps. Less than a year later the castle returned to the Teutonic Knights, having been recaptured by mercenary troops. As the castle grew in stature, so did the settlement outside its walls. It later gave rise to a town, first by receiving a right to hold regular markets, which largely aided its growth. In the 16th century Ryn became a centre of administration and settlement action for the nearby lands. When the Order of Teutonic Knights had been dissolved, the town was designated an administrative capital for one of the districts in Ducal Prussia. Unfortunately, a raid of Tatars in the mid-18th century dispelled dreams of further development. The attackers took some of the town's inhabitants as prisoners and slaughtered the others, plundering and burning the houses. The castle was the only surviving building in the whole town. Half a century later an outbreak of bubonic plague caused such great loss of human lives that many of the villages around Ryn were completely depopulated. Those who were not struck by the disease searched for hiding in the forests. In 1723 Ryn was granted a town's charter. This move was to help the town's reconstruction and stimulate its growth. New settlers arriving in Ryn were offered many privileges - they were given land to build new houses, they could lumber wood for the construction of a house also free of charge and they were refunded one third of the costs of the construction works. 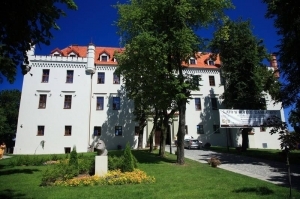 In the second half of the 18th century the castle was left empty and offered for sale. From the end of the 18th century to the mid-19th century it changed owners several times until finally it was turned into a prison for women. During World War Two the castle was used to detain Russian and Polish POW's as well as German prisoners. In July 2006 a four-star luxury hotel was opened in the castle, called the Ryn Hotel. The hotel can satisfy expectations of the most demanding guests. There are nearly 300 beds in 140 rooms, including 5 luxury royal suites and 20 rooms offering higher standard of service. 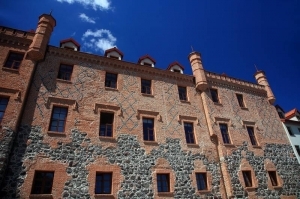 To uphold the historical traditions of the Teutonic castle, the hotel has been divided into four sections: the Monastic, the Knights', the Hunters' and the Prison. The interior design draws on the architecture of the castle, exposing some authentic remnants of frescoes, polychrome walls and ceilings, Gothic door and window frames and vaults. The castle restaurant, also featuring a Gothic style of design, can serve 300 guests at a time. The menu contains dishes typical of the old Polish kitchen, including the cuisine of nobility, and European meals. 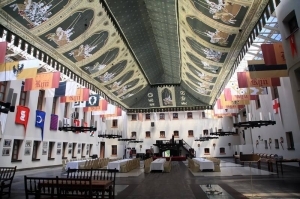 In addition, the Ryn Hotel has a modern and professionally equipped Convention Centre, which consists of 6 conference rooms (with the largest Convention Hall holding 500 seats, located under the castle's inner court) and the Business Centre.